An explosion of flavor! 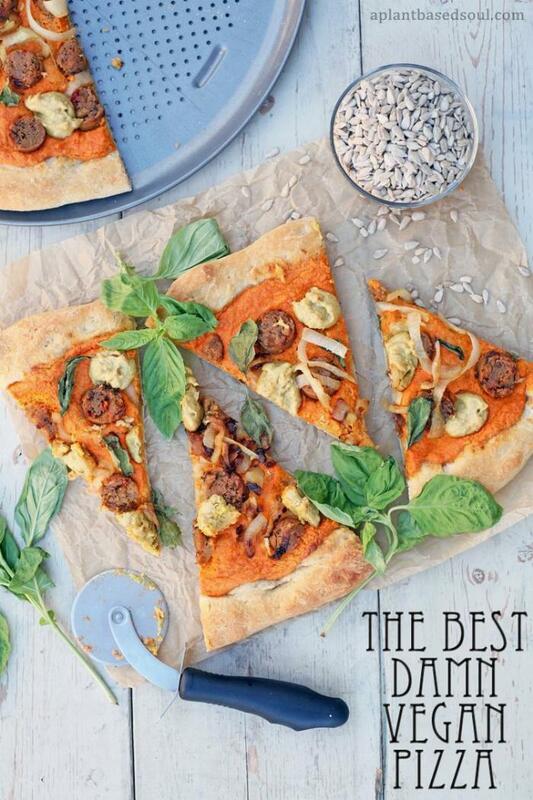 This pizza has a roasted red pepper and sunflower seed sauce as a base, and topped with crushed garlic, caramelized onion, vegan italian sausages, cashew cheese, and fresh basil leaves. 1Begin by preparing the pizza dough (unless you purchased ready-made dough instead). Combine all ingredients in a stand mixer with a dough hook and mix until combined. Alternatively, combine all ingredients in a bowl and mix with a wooden spoon by hand. Cover with a clean towel and let sit for 45 minutes until it has risen to double its size. 2While the dough is rising, prepare the roasted red pepper sauce. Slice the red pepper into thin strips and sauté in 1/4 cup of water until soft. When red pepper is done, combine all ingredients into a high powered blender and blend until smooth. Add 1 tbsp of water at a time until a thick sauce consistency has formed. Set aside. 3Next, prepare the cashew cheese. Add all ingredients to the high powered blender and blend until smooth. The consistency should be thick. 4Lastly, chop the onion into thin rings and sauté in 3 tbsp olive oil until caramelized. 6When dough has risen, remove from bowl and spread onto a round pizza pan or baking sheet. If it is sticky, add a bit more flour. Top with red pepper sauce and spread around to coat the whole pizza, leaving room for the crust. 7Top with remaining ingredients (caramelized onion, crushed garlic, cashew cheese, and Italian sausages), making sure to not add the basil at this time. You can just drop dollops of cashew cheese evenly around the pizza. 8Bake pizza for 20 minutes. After 20 minutes, remove and top with fresh basil. Return to oven and bake for another 3-5 minutes.